"How to Make Victoria Sponge" the book is here. Colossians 3:23 Work willingly at whatever you do, as though you were working for the Lord rather than for people. When I became unwell a few years ago I wandered what the Lord wanted me to do with my life. It was one of those crossroad moments. I knew that I could not carry on as I had been doing, but then I also knew that God had something in mind for me to accomplish. So I prayed and took a step into the unknown with God as my navigator. He told me to write and that is what I did. I am so pleased that I did what God told me to do, as today I received the first printed copy of my book "How to make Victoria Sponge - A journey of faith". God put the desire on my heart and inspired me to write, He took me on a journey that I thought was not possible. Writing a book was a monumental task, more akin with climbing a mountain while carrying a goat on my shoulders. God broke through my misgivings, my own limitations and showed me that with Him all things are possible. This is so true and I could not have accomplished writing a book without God's help for He made it possible. 17 So you see, faith by itself isn't enough. Unless it produces good deeds, it is dead and useless. Faith can never be static for a christian because it requires action. Our belief in God can diminish if we stand still. Our belief needs to be underpinned by faith and our faith requires action because it is dynamic. So often we are waiting a response, and if we do not receive it our belief starts to dwindle. We begin to question God, asking why He has not answered our prayers. When we attend our churches/meetings/prayergroups/house groups/services, our faith requires action. Do we stand and mouth the responses bored of the repetition because it is so familiar? Do we stand and watch others as they raise their hands thinking that their response is a bit over the top? Do we shy away from sharing our testimony because we feel it is not as amazing as someone else's, or we feel it isn't that important? Do we sit and watch the other people and wonder why their life is better than ours when we know they have sinned big time? It is easy to loose our belief. It is easy to judge and become disgruntled by apparent misjudgments, if our faith lacks action. When our belief is dwindling our faith needs to take a front row position. We need to remember Faith is dynamic it requires action. When our brother's or sister's are struggling we need to act because that action will fuel our belief. God can and will act alongside our actions. His Holy Spirit will light up our actions. That first thought of help for someone else, that deciding to embrace a holier response to the mundane in church, that brave lifting of your hand in praise, that decision to say a few words that might encourage someone else to testify when they see you take the first step, that forgiveness for thinking others have life better than us even though you know they have sinned, are all responses to action driven by Faith. All will fuel your belief. All will bring about answers. Stepping out in faith, is exactly that. It is the first action of a conscious decision to believe in a Greater answer. It is not selfish, it is giving, and in that giving someone else will decide to be brave and take action. Faith is contagious when it is selfless. When it is driven by Light. Faith does not grow in darkness, in the selfish world of our wants and needs. Faith is connected directly with the Resurrection. If Jesus has just died our belief would have died with Him. But Jesus continued on to the Resurrection, to the Light. His actions saved us through His Mercy. Faith is Light and Mercy, action and compassion. Actions are faith in motion through a compassionate heart. Each day our 'Yes' to Faith needs to be backed up by action. Each small act is a victory for God and a thorn to the fallen world and its rulers. Each small act is a personal victory for our faith and an encouragement to our belief which we can witness next time at our church/meeting/prayergroups/house groups/service. When we next ask 'What is God doing?' we can answer this question with examples of our faith in action, as God is in the center of them through His Light opening our eyes to the needs of others. Our actions when coupled with faith have a domino effect, because God is in them. Faith requires action. What will be your response today? God is incapable of seeing the bad in us. He can only see the good that is in us. How do I know that this is a truth? Sin comes from the devil not from God. Sin is bad, evil, darkness and death. God is light, holy, goodness and life. When Jesus called out to God from the Cross "My God, my god, why have you forsaken me?" (Matt: 27:46), God could not look at His Son, Jesus, because he was carrying our sins. 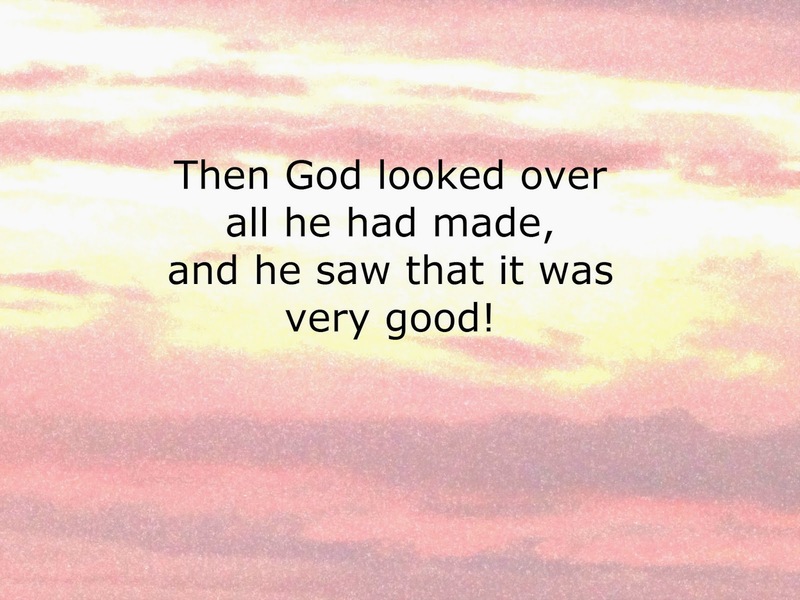 God could not look at the evil, because He is Light, Pure, Goodness and Life. When God looks at us he looks at us in Love, because God is Love by his very nature, therefore His love is pure. This pureness only sees good. And God's good pleasure was to allow His son Jesus Christ to take upon himself our sins so that we could follow the goodness of Christ and be worthy through God's Grace, and His Grace alone, to be with Him in his eternal Kingdom. The most beautiful thing you can do for God is to choose to love Him and to live your life dreaming of a forever after in His Kingdom. God will honour you and your choice. He will send blessings upon you and increase your love. He will live in you. What could be more amazing than to have God within you? Your body as His temple of Love? You will experience such joy. Your life will have purpose. You will live, not just survive. You will be fulfilled and filled with His Spirit. Breath Him in, breath Him out. Allow God to be your life force. It is life changing. Grow in love. Be in love with the God who loves you. Raise your arms in submission of His love. Receive His love. He wants you have it. To bathe in it, to be healed by it. To express it, to share it, to heal others with it. His love brings peace, destroys the warring powers within, and creates a new being. Accept His new life. Rise and be loved.